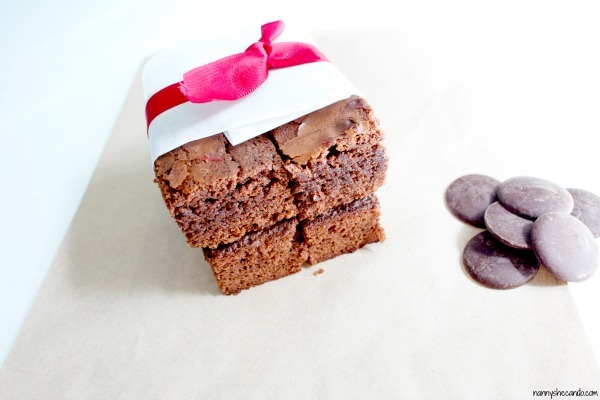 Today I’m sharing this decadent chocolate brownie recipe. In the nanny family, these brownies are a bit like how I’m addicted to coffee. Meaning they can’t go without them for long. Not only do all three kids request I make them every few days, so do Boss Mum and Dad. 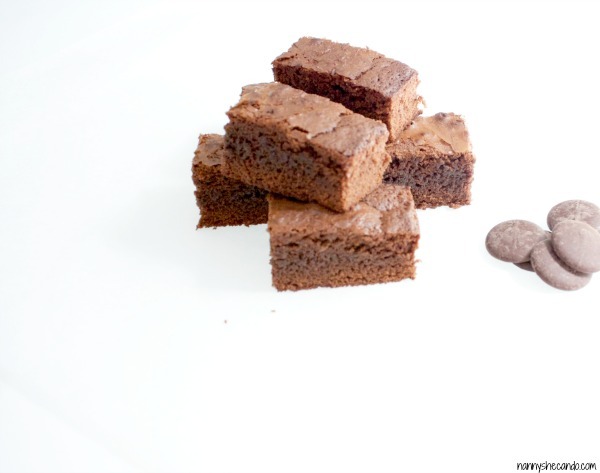 Actually, these Chocolate Brownies also rate pretty highly on the boyfriend’s list of requests. Although to be honest, so do berry muffins, apple tarts, banana bread, fresh-baked bread, a solid man’s dinner every night and if I had time to make him lunch everyday, he wouldn’t complain either. So, scratch that. I’ve not got three kids requesting these, but four. Personally I’ve never been a huge fan. I’m not saying I don’t like them and never eat them, because that would be a lie. Just that I’m more inclined to munch on the chocolate buttons (hello, chocolate!) before they end up in the pot melting into treacle-like goodness with the creamy butter. The result is this rich, gooey sludge that looks like heaven on earth. I’m sure you know what I’m talking about. When the kids jump up on a stool and help stir the pot, both literally and figuratively sometimes, they get this dreamy look on their faces that I imagine freshly washed dogs get at the sight of dirt and grass. They just have to roll around in it. 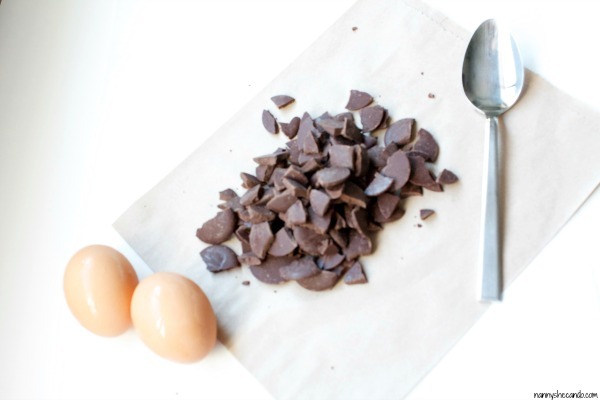 The skeleton of this recipe is originally inspired from this Kids Choc Brownies recipe I found on Kidspot long ago. Although I think it’s fair to say that after many years of improvising with whichever ingredients I could rustle up from the pantry at short notice, these gooey chocolate brownies have gradually become my own. 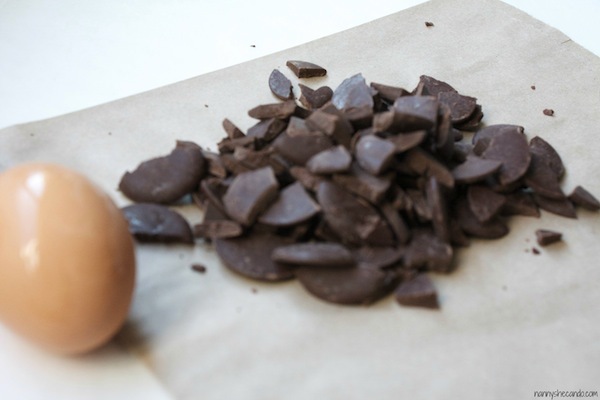 The best part of this recipe is that its super quick and easy to do. Most times I find myself making these gooey chocolate brownies late in the afternoon at the request and insistence of the girls. They’ll usually help out which saves on time but also means that they kitchen looks as though a flower bomb just hit. In reality, I make these one-handed with a baby on my hip, with a pot of spaghetti on the stove for dinner, with school lunches for the next day laid out ready to go, with a puppy scratching at the bench going crazy for chocolate and most likely completing some form of school homework. 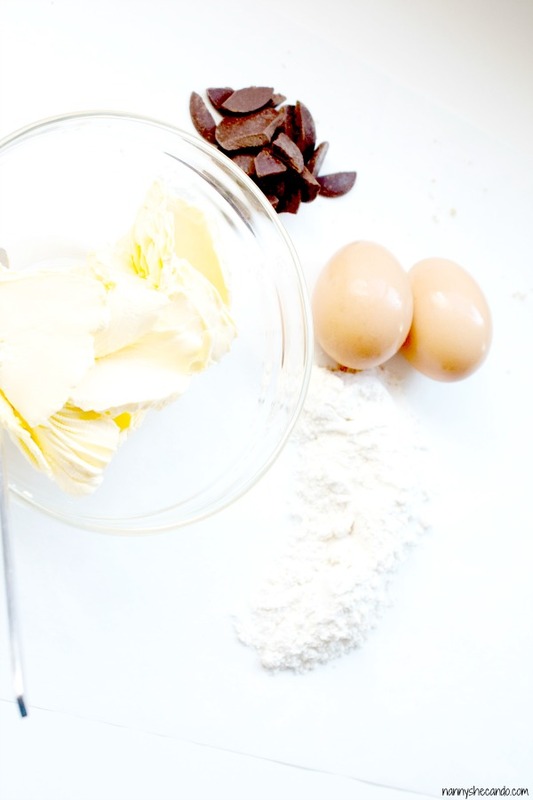 If that doesn’t convince you how easy it is to whip up, I don’t know what will! 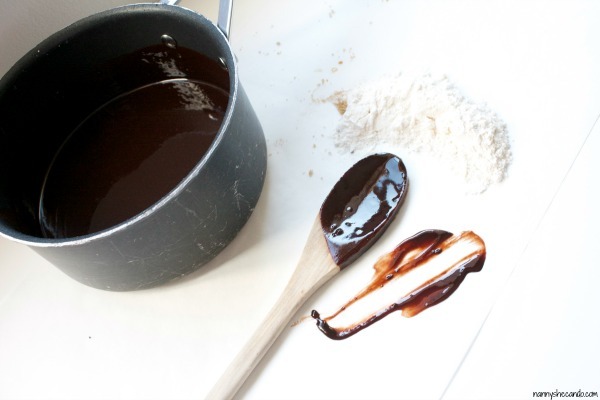 Melt the butter and chocolate buttons together on low heat, stirring constantly. Take off the heat and add vanilla essence. Whisk quickly whilst adding the eggs so they don't cook with the heat. Add the cocoa powder and sugar and mix to combine. 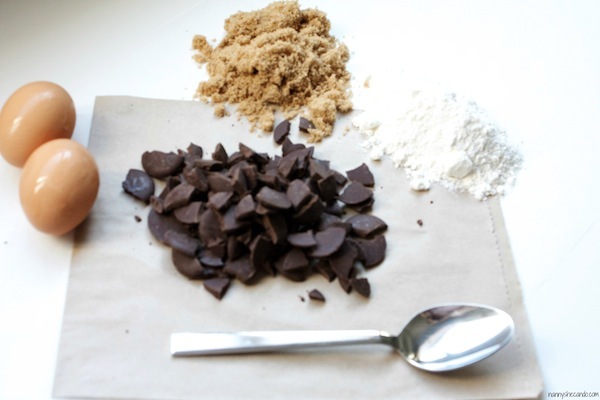 Sift the flour and baking powder together and fold into mixture with the mars bar pieces. Be careful not to over mix. 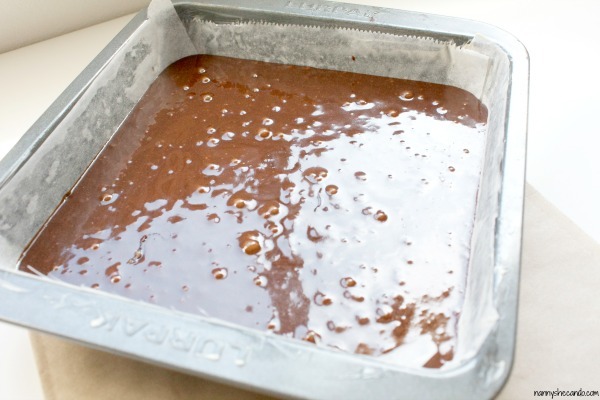 Pour into a lined brownie tin and bake in a pre-heated oven at 180 degrees celsius for 30 minutes. Allow to cool. Dust with icing sugar or leave plain and slice. >>> Do you love gooey fudge-like brownies or cake-like brownies? Oh my!!! They look amazing! Great for school holiday baking I’m thinking!!! You should definitely give the mars bars a whirl, let me know how it goes! Holy moley, these look amazing. My kids and husband will go bonkers for them. The addition of the mars bar is genius. Just curious, how much is half a cup of mars bar? Is it one bar – more…less? Brownies must be gooey!! These look amazing thanks for sharing!! Wow, I so could eat this right now!